7 Our fathers understood not Thy wonders in Egypt; they remembered not the multitude of Thy mercies; but provoked [Him] at the sea, [even] at the Red Sea. 8 Nevertheless He saved them for His name's sake, that He might make His mighty power to be known. 9 He rebuked the Red Sea also, and it was dried up: so He led them through the depths, as through the wilderness. 10 And He saved them from the hand of him that hated [them], and redeemed them from the hand of the enemy. 11 And the waters covered their enemies: there was not one of them left. Apparently things have changed a bit geographically since the Exodus. The Gulf of Suez has "dried up fifty miles north of present shore" (Companion Bible note on Exodus 13:18). "The present geography of the Eastern Delta does not, today, agree with the Biblical record. But its geography in the nineteenth dynasty [of the Egyptian pharaohs] is well known from papyri, and is in perfect accord with it, as given in Exodus" (note on 14:2). 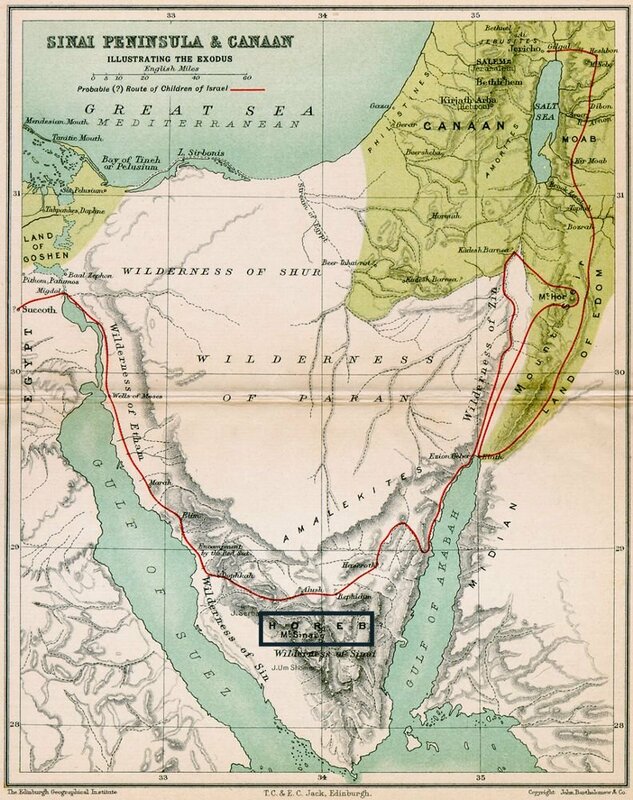 In other words, during the Exodus the Gulf of Suez extended farther north than is indicated on the map. I've emphasized Mt. Sinai (in the blue box), the location where Moses received the Law of the Ten Commandments. All of its eyes are eyelands (islands). Actually this is the first time I've seen eyes represented by groups of islands, as if the eyes were smashed, and thus the snake blinded. In the northern eye the largest island is Juzur Tawilah. 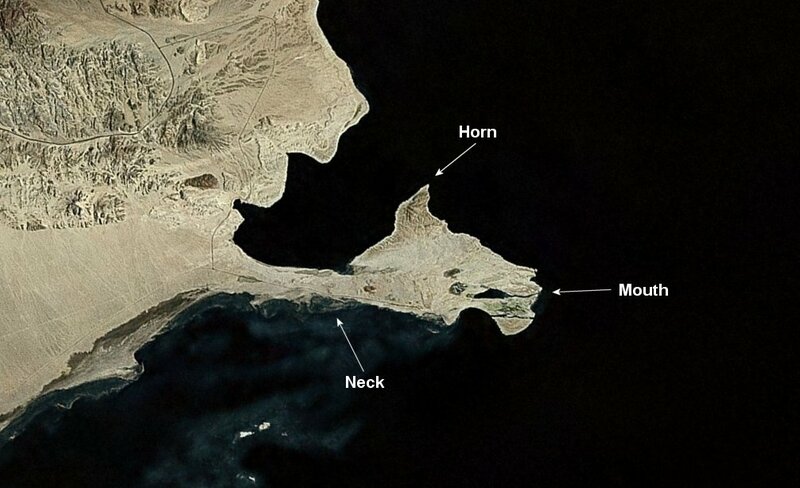 On the southern head, the western (upper) eye is composed of the islands of the Dahlak Archipelago; the eastern, of the Farasan Islands. Ironically, there are no sea snakes in the Red Sea, apparently because of its relatively high salt content. Although uncommon, two-headed snakes are not rare, and neither are other two-headed reptiles (see Wikipedia). I believe this is so we would get a better understanding of the multi-headed beast/dragon of Revelation, and of course, of the Serpent himself. 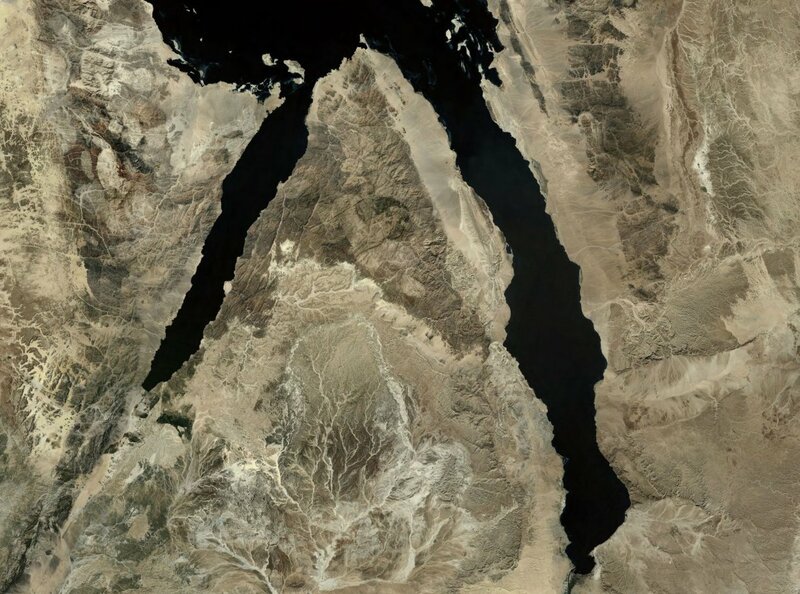 If you compare this photo to the map of Sinai, note that the Exodus crossed, as it were, right over the mouth of this snake, as if they walked over or trampled on the Serpent's head! 1 Then was Jesus led up of the Spirit into the wilderness to be tempted of the devil. 2 And when He had fasted forty days and forty nights, He was afterward an hungred. 3 And when the tempter came to Him, he said, If Thou be the Son of God, command that these stones be made bread. 4 But He answered and said, It is written, Man shall not live by bread alone, but by every word that proceedeth out of the mouth of God. 5 Then the devil taketh Him up into the holy city, and setteth Him on a pinnacle of the temple, 6 And saith unto Him, If Thou be the Son of God, cast Thyself down: for it is written, He shall give His angels charge concerning thee: and in [their] hands they shall bear thee up, lest at any time thou dash thy foot against a stone. 7 Jesus said unto him, It is written again, Thou shalt not tempt the Lord thy God. 11 For He shall give His angels charge over thee, to keep thee in all thy ways. 12 They shall bear thee up in [their] hands, lest thou dash thy foot against a stone. 13 Thou shalt tread upon the lion and adder: the young lion and the dragon shalt thou trample under feet. Verse 13 is interesting in that it mentions the Dragon, another of Satan's names. If you take another look at the Red Sea snake, please note that the northern head is pictured swallowing the Sinai Peninsula. 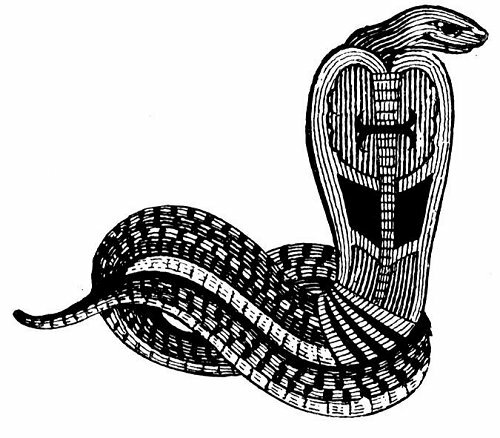 If we combine that with the map of the Sinai, it could be an illustration of the Serpent trying to destroy the Law; Moses being symbolic thereof (2nd Corinthians 3). 21 And Moses stretched out his hand over the sea; and the LORD caused the sea to go [back] by a strong east wind all that night, and made the sea dry [land], and the waters were divided. 22 And the children of Israel went into the midst of the sea upon the dry [ground]: and the waters [were] a wall unto them on their right hand, and on their left. 23 And the Egyptians pursued, and went in after them to the midst of the sea, [even] all Pharaoh's horses, his chariots, and his horsemen. 24 And it came to pass, that in the morning watch the LORD looked unto the host of the Egyptians through the pillar of fire and of the cloud, and troubled the host of the Egyptians, 25 And took off their chariot wheels, that they drave them heavily: so that the Egyptians said, Let us flee from the face of Israel; for the LORD fighteth for them against the Egyptians. 26 And the LORD said unto Moses, Stretch out thine hand over the sea, that the waters may come again upon the Egyptians, upon their chariots, and upon their horsemen. 27 And Moses stretched forth his hand over the sea, and the sea returned to his strength when the morning appeared; and the Egyptians fled against it; and the LORD overthrew the Egyptians in the midst of the sea. 28 And the waters returned, and covered the chariots, and the horsemen, [and] all the host of Pharaoh that came into the sea after them; there remained not so much as one of them. 29 But the children of Israel walked upon dry [land] in the midst of the sea; and the waters [were] a wall unto them on their right hand, and on their left. 30 Thus the LORD saved Israel that day out of the hand of the Egyptians; and Israel saw the Egyptians dead upon the sea shore. 31 And Israel saw that great work which the LORD did upon the Egyptians: and the people feared the LORD, and believed the LORD, and His servant Moses. 19 Now therefore ye are no more strangers and foreigners, but fellowcitizens with the saints, and of the household of God; 20 And are built upon the foundation of the apostles and prophets, Jesus Christ Himself being the chief corner [stone]; 21 In Whom all the building fitly framed together groweth unto an holy temple in the Lord: 22 In Whom ye also are builded together for an habitation of God through the Spirit. 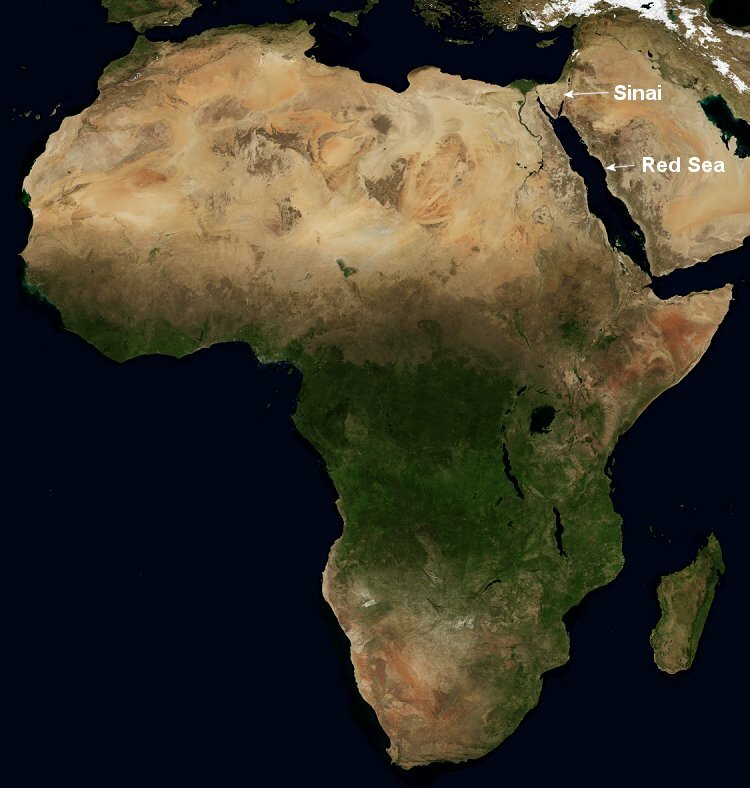 In closing I would like to zoom out, and look at the Red Sea and Sinai Peninsula in relation to Egypt and the rest of Africa (in case you haven't yet done the study on Africa, please go there now so that I don't ruin the surprise for you). Having that background, note that the Red Sea snake is on the forehead of Africa! 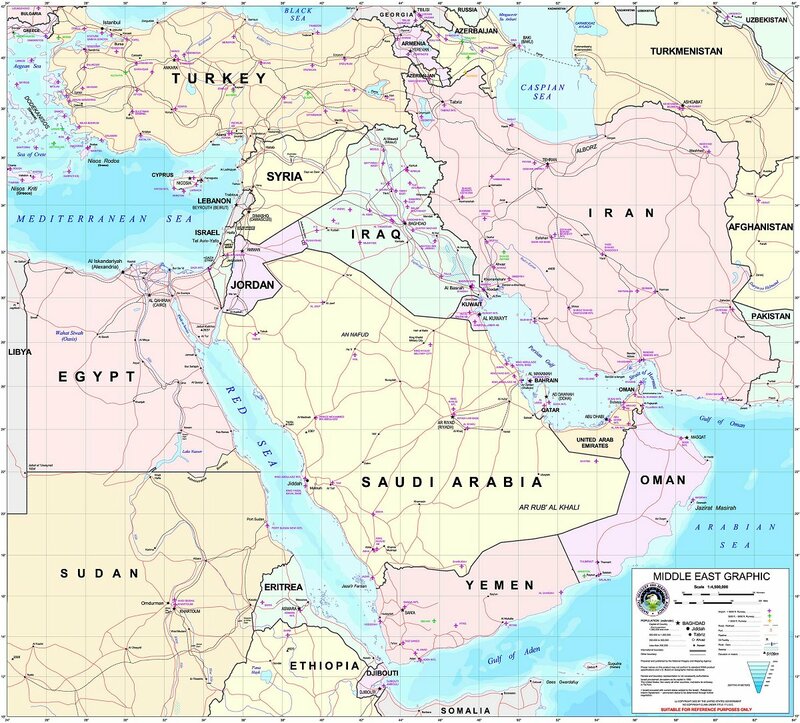 The Sinai Peninsula as well, which is shaped like a pyramid. And both the Sinai and Red Sea are adjacent to Egypt, home of the pyramids. Does this sound familiar? The snake was a symbol of power and wisdom in Egypt, and was worn by pharaohs on the forehead of their head dress (see Wikipedia). It is said that from this came the snake (and false beard) that used to be on the head of the sphinx. I believe that is backwards. 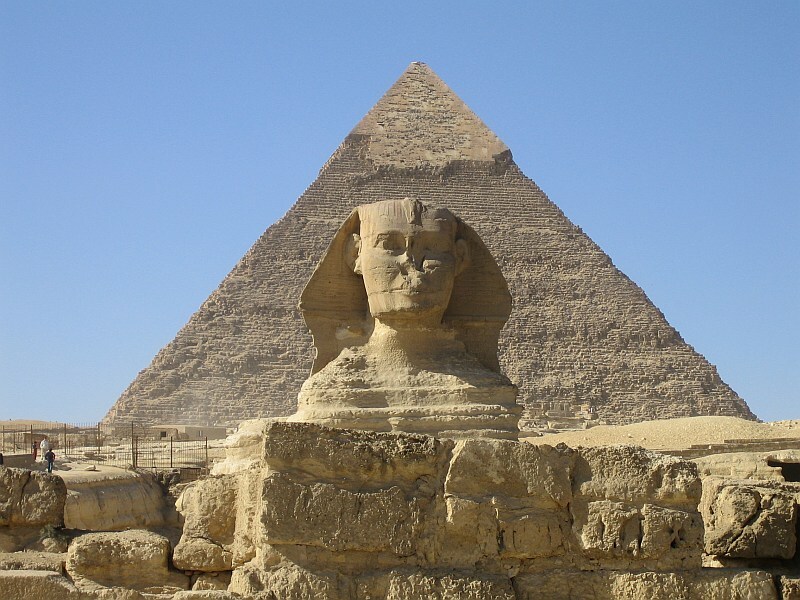 I believe the Sphinx (and great pyramids) pre-date the Egyptians, and it was they who copied it out of veneration for some made up god of theirs. The Great Pyramid has been called the Bible in stone (see The Great Pyramid Decoded by E. Raymond Capt). I think the Sphinx is the key to the Bible in the stars. It faces due east, and is a combination of Virgo and Leo, the beginning and end of the zodiac. The snake that was on her forehead represents the Serpent, and the fact that he deceived Eve in the garden of Eden. Remember what he promised her in Genesis 3? 1 Now the serpent was more subtil than any beast of the field which the LORD God had made. And he said unto the woman, Yea, hath God said, Ye shall not eat of every tree of the garden? 2 And the woman said unto the serpent, We may eat of the fruit of the trees of the garden: 3 But of the fruit of the tree which [is] in the midst of the garden, God hath said, Ye shall not eat of it, neither shall ye touch it, lest ye die. 4 And the serpent said unto the woman, Ye shall not surely die: 5 For God doth know that in the day ye eat thereof, then your eyes shall be opened, and ye shall be as gods, knowing good and evil. 6 And when the woman saw that the tree [was] good for food, and that it [was] pleasant to the eyes, and a tree to be desired to make [one] wise, she took of the fruit thereof, and did eat, and gave also unto her husband with her; and he did eat. 7 And the eyes of them both were opened, and they knew that they [were] naked; and they sewed fig leaves together, and made themselves aprons. This was not a dumb snake, and Adam and Eve weren't conversing with a reptile. That old Serpent, called the Devil and Satan, twisted God's Word like a snake, and seduced them (2nd Corinthians 11:3). Then Eve gave birth to Cain, the first of many snakes on the Earth (John 8:44).